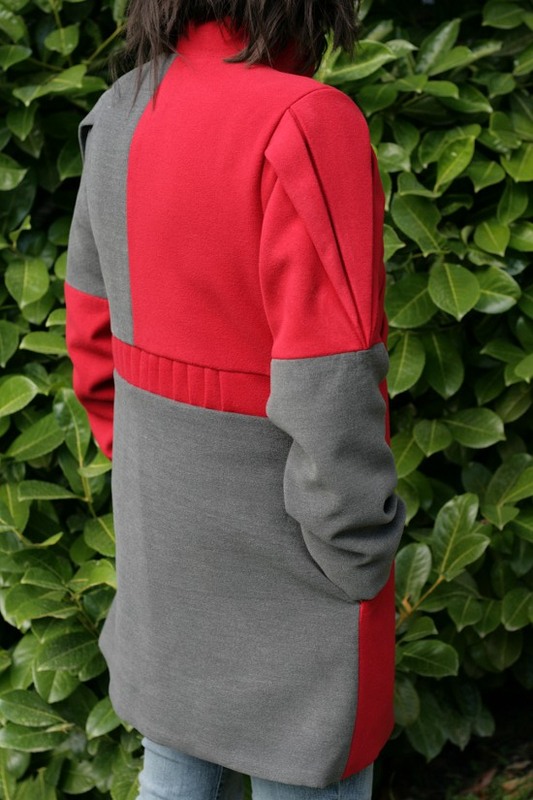 Here is, at last, my origami coat for which you have helped me pick a color block version. Thank you! 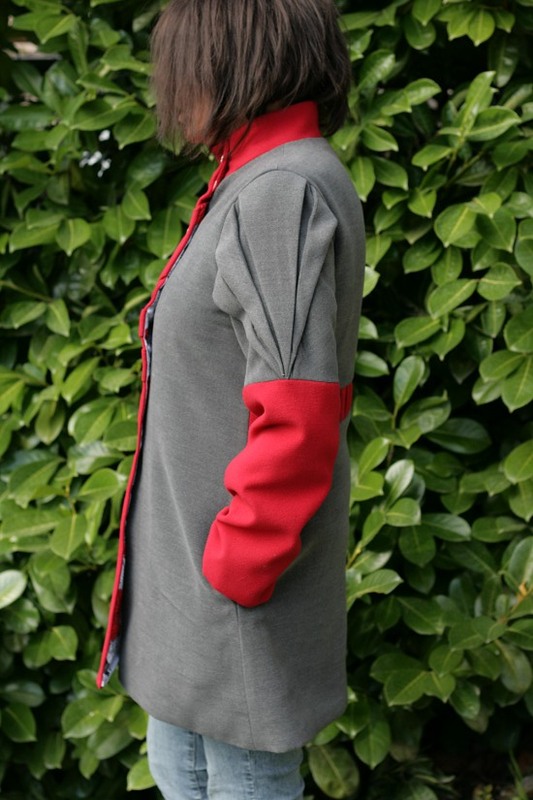 It’s in the title, this origami coat is a Lalimaya (small French company) pattern. It is available in a child or adult version. 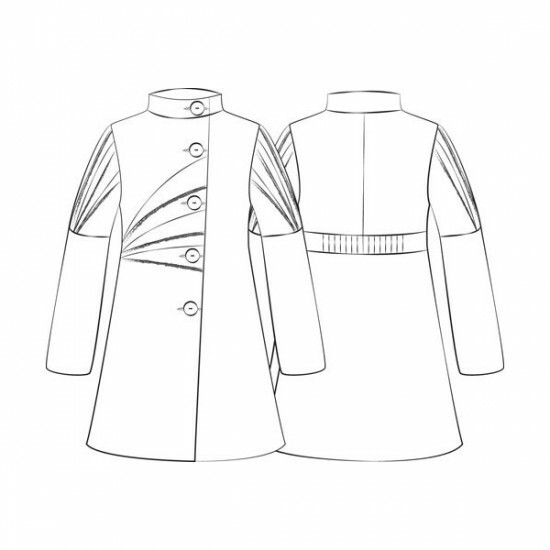 It’s a lined coat with: stand up collar, inseam pockets and of course the pleats without which it could not be called the Origami Coat. Fan pleats are on the right front and sleeve heads. Regular pleats give texture to the belt band at the back. There is no shoulder pads. 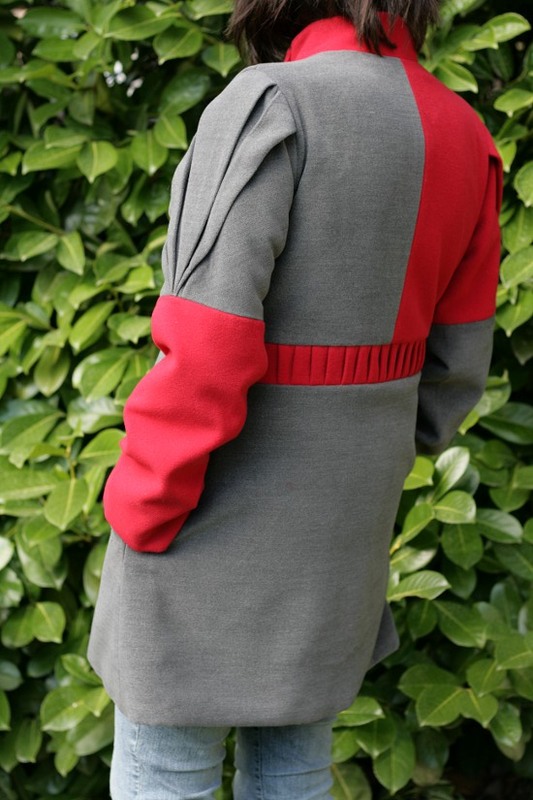 This is stated on Lalimaya’s website, and I agree, I would not recommend this pattern as a first coat. Construction may be a headache for a beginner as the instructions are not illustrated. But if you’ve already done one or two coats and you like this one, go ahead, this is truly a unique design ! Hum, of course there is also the language barrier… This is only available in French. You’ll find a French-English sewing dictionary on my blog to help you. I could also translate the instructions if a few need it. [box type=”warning”] It is important to be careful when you place the pattern pieces on the fabric before cutting. 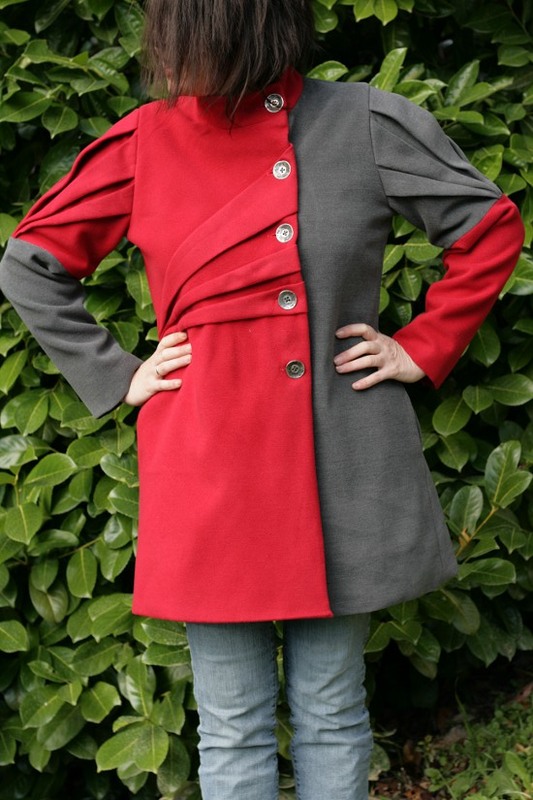 Indeed, this coat has different pieces for the right-front and the left-front and mistakes happen quickly. But if you pay attention to the cutting layout everything should go smoothly. But check twice that you didn’t put a piece on the wrong side. AND, following the cutting layout, when you’ll cut on a single layer for front-left and front-right pieces, you’ll have to lay your pattern on the right side of the fabric. There is no size chart on the pattern. So, to pick the size, I started by measuring the lining pattern pieces and compared the measurements to a coat that fits me well. By this little comparison I chose size 40 (French size). BUT for a coat which requires more work and time than a simple blouse, I did not stop there. To confirm that this was the right size, I made a quick muslin of the lining (right front + left front + back) in a bed sheet that was lying there (oops!). I also drew, on the lining back, the belt band to be sure that it sat in the right spot for me (it did). Everything was fine so I traced the size 40. 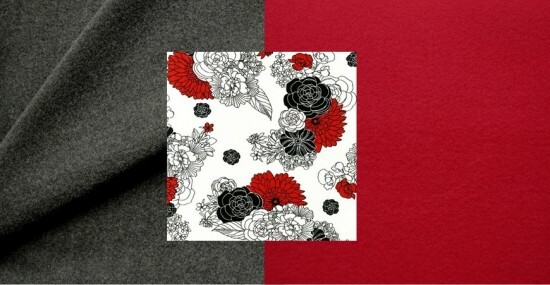 Outer fabric : a red wool and a gray wool. Well not wool actually it’s synthetic fibres. Lining: a printed cotton by Melissa Crowley for Robert Kaufman: “The woman spring bouquet” ; bought at Hawthorne threads. The iron really steamed to construct this coat, because in many places we are left with 4 layers of fabric to sew together and I didn’t pick the lightest fabric there is. I had to grade the seams and press like crazy to tame the 4 layers that are in the seam where the pleats meet the armhole and the right-front lining. After “preselecting” 4 color-block versions that I liked, it was you who decided that I’d make this version here. 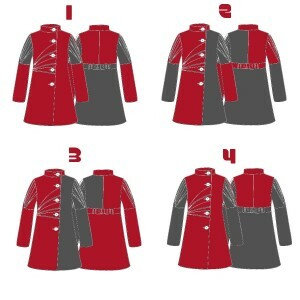 The vote took place a few weeks ago : Origami Coat : help needed ! Thank you again for your votes, without you I would still be deciding ! Version #2 won with a comfortable lead. – Version #2 wins with 65 votes out of 151! – Followed in order by versions #4, #1 and #3. 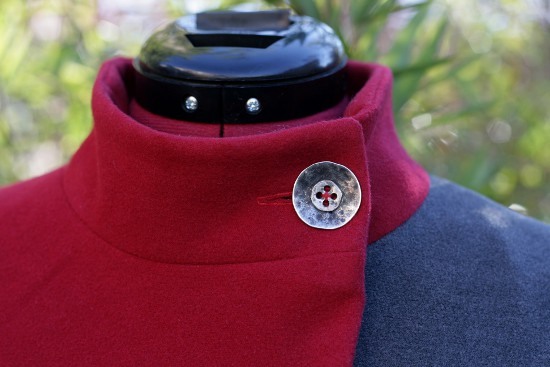 Nothing much, I only interfaced a collar piece (the inner one that attaches to the lining). Oh and also (this is not really a change, but well …) instead of drawing a seam allowance of 1cm I drew a 1.5 cm seam allowance, simply because I am more used to sewing with this measure. If you do the same, do think to add a seam allowance ot of 4.5 cm instead of 4 cm for the hems. I thought for a moment to make front facing pieces from the lining pattern. But after testing buttonholes I didn’t : 3 layers of outer fabric + lining was fine but with 4 layers of outer fabric the buttonhole was a mess. So basically no change in design from the original pattern. J’adore ! I love it ! Well, not much more to add, this is truly a unique design. 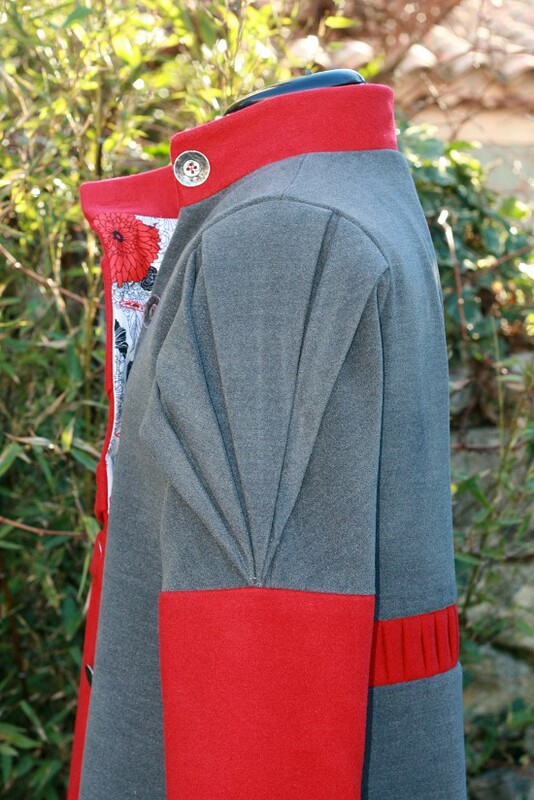 The sewing of the pleats really deserves care because it is the focal point of this coat. I took pictures during construction and I will make a little tutorial for this. I hope it will help those who want to sew the Origami coat. Thanks to my mother in law, Maryse, for taking pictures of me wearing my new coat! 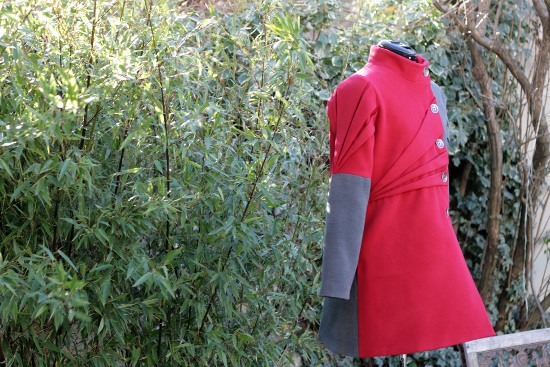 Origami coat in the wind, again ! Label, bought at Lalimaya’s also ! Me in my coat ! 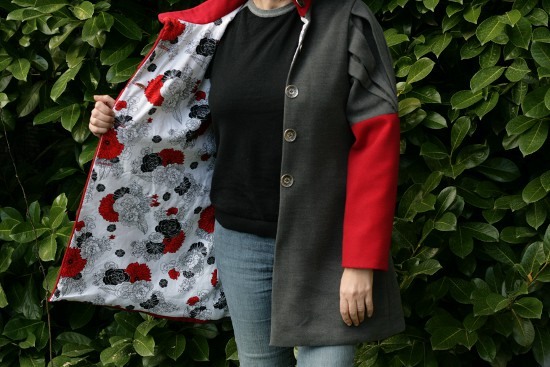 I took me 4 afternoons to sew this coat (cutting not included). 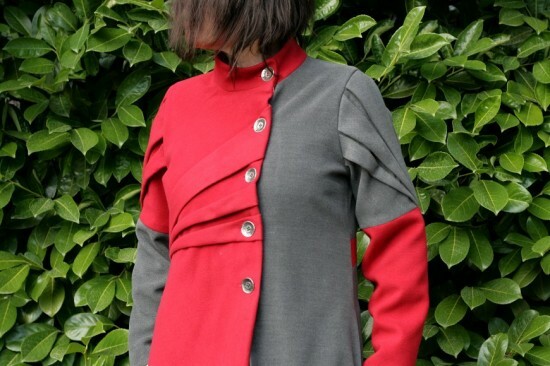 Origami coat : help needed ! 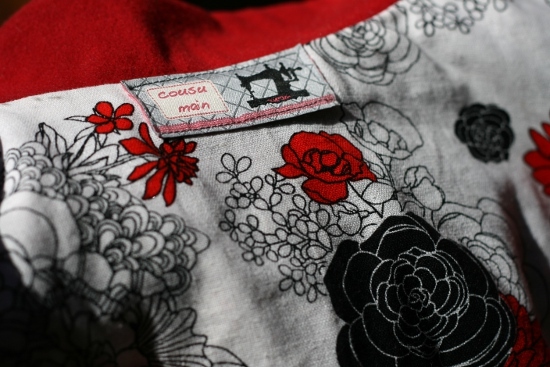 This entry was posted in Blog, Clothes, Sewing Projects and tagged Lalimaya by Véro. Bookmark the permalink. This is a wonderful piece of work. It’s gorgeous and so well made. 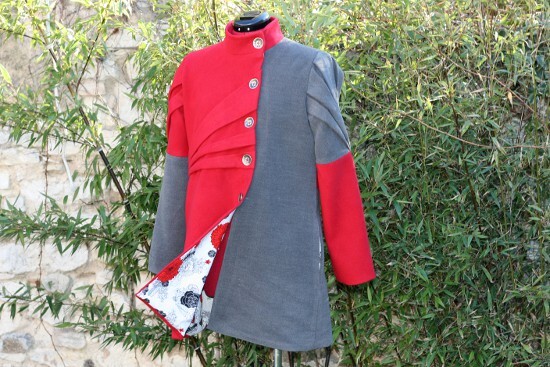 Every decision you made and suggestion you took have resulted in a fabulous coat. I’ve never seen this before and I am in awe.